A gabled cabin by architecture studio Atelier Bow-Wow and a faceted pod by artist Didier Faustino have been installed inside a Parisian gallery as part of an exhibition about imaginary worlds. 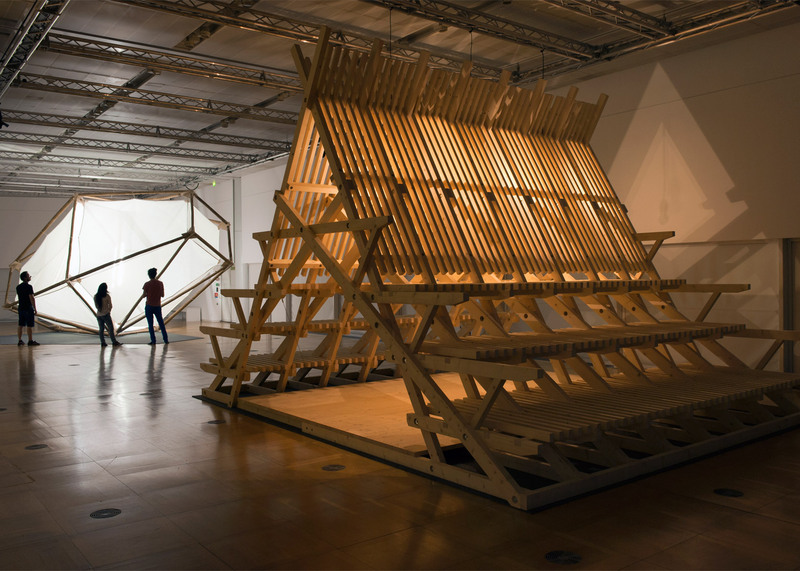 The two wooden installations, one by the Japanese architecture firm and one by the French artist, are on show as part of The Magical House exhibition at Maison de la Culture du Japon à Paris (the Japan Cultural Institute in Paris). The exhibition forms the second part of Transphere Exhibitions, a collection of events organised in Paris to showcase the "imaginary worlds" of emerging and established artists. Tokyo-based Atelier Bow-Wow's contribution is a gabled wooden cabin that references traditional Japanese architecture. Named Chigi House, it is made from rows of interlocking pine beams that offer a sheltered space inside for visitors as well as bleacher-like seating on the outside, built into the sloping roofline. "Both opaque and transparent, this structure reminds us as much of the slatted facades of traditional Japanese townhouses, or machiya, as it does of the roofs of the first Shinto shrines," said the gallery in a statement. Faustino's installation is called A Home is Not a Hole and features a faceted egg-shaped frame made from eucalyptus tree trunks. Suspended inside is a translucent fabric pod, it is designed as a refuge from the outside world – although visitors can't enter it. "You could close yourself inside in order to open up to other areas, to travel elsewhere, even within oneself," said the gallery. "This cabin might also be a childhood memory, a space shuttle in which we imagine traveling through the cosmos." Both projects took inspiration from In Praise of Shadows, an essay by Japanese novelist Jun'ichirō Tanizaki. First published in 1933, it contrasts trends in eastern and western architecture at the time. The essay looks at the incompatibility of modern technology with the traditional Japanese aesthetic and complains about the over-use of electrical lighting in the west "to eradicate every trace of shadow". As a nod to the work, the installations are housed within a darkened room, illuminated by small fixtures that cast shadows on to the walls of the gallery. Two strip lights inside Faustino's pod create a bright white glow that is diffused through the fabric, while Atelier Bow-Wow's project is softly lit by three warm-coloured hanging bulbs. The structures are made of wood from a forest in Portugal and will be relocated to the country as public pavilions after the exhibition. Hou Hanru, who is artistic director of the MAXXI in Rome, curated The Magical House, which is on display at Maison de la Culture du Japon à Paris from 8 June to 30 July. Faustino, who splits his time between France and Portugal, is known for his large-scale and immersive installations. Last year he built a spiky platform outside the AA school to encourage spontaneous public speaking and staged a month-long performance around Cuba's Modernist School of Ballet. Tokyo-based architecture firm Atelier Bow-Wow was founded in 1992 by Yoshiharu Tsukamoto and Momoyo Kaijima. Its recent projects include a floating sun-deck in the Bruges canal for the city's first art and architecture triennale.